Sleep effortlessly during airplane or road travel and wake up refreshed and rejuvenated without any neck pain or strain - our Inflatable Neck Pillow offers amazing comfort and folds in a compact form! ORDER NOW and get this incredible travel neck pillow delivered to you in just 3 to 5 days! ABSOLUTE TRAVEL ESSENTIAL - Engineered to inflate/deflate effortlessly, Doroboro Travel Pillows offer a perfect balance of comfort, luxury and ease of use. Our incredible travel neck pillow can be inflated simply with few pushes of a button (takes less than a minute) and can be deflated just by opening a valve. When deflated, the traveling pillow folds into a compact form in the included cover, making it extremely convenient to carry along! ALL-IN-ONE SLEEPING KIT - We have designed a perfect kit to ensure that none of the distractions affect your sleep quality - be it light, sound or discomfort caused by your head banging against window shades or lolling on other passengers. Besides the inflatable travel pillow, the kit includes a 3D sleep mask to obstruct any light and creates favourable conditions for sleeping, earplugs to prevent any noise disturbances, and an Instruction Book for ease of use. PREMIUM QUALITY TRAVELING NECK PILLOW - Sleep like a baby even on long haul flights, while traveling in a train, bus or car, or during camping, as this U shaped neck pillow perfectly cradles your neck and the crystal velvet offers a cosy surface to rest upon. The outer velvet layer and the inner PVC layer both are extremely durable, and impart this neck support pillow a very long life. The neck pillow (travel) comes in a chic design & Dark Green Color, and weighs just 270 grams. DESIGNED FOR BETTER HYGIENE - The best part is that the cover of the airplane pillow or travel pillow case can be removed and washed, which allows for a good level of sanitation after the pillow has come in contact with potentially contaminated surfaces such as airplane seat, public chairs, travel clothing, dust or germs. The pillow could also be used to support your neck when sitting in upright position for long - be it a bed, lounging in the hotel or for the purpose of nursing. 100% RISK-FREE SATISFACTION GUARANTEE - We also offer you 100% risk free satisfaction guarantee on these travel neck pillows to let you buy with confidence. 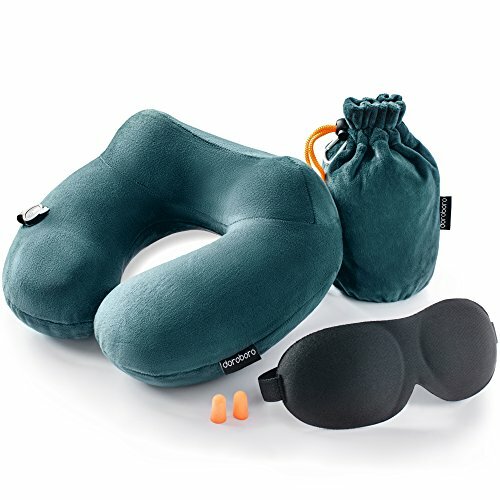 However, we are quite sure that you will be impressed with its functional effectiveness in supporting your neck, its ultra comfortable design, and the fact that it comes with other important sleeping aids like 3D sleeping mask and earplugs, and will agree that it is the best travel neck pillow deal! If you have any questions about this product by doroboro, contact us by completing and submitting the form below. If you are looking for a specif part number, please include it with your message.